Really great read! I really enjoyed Emma and Galen's story. It was a very cute, but serious at the same time, sort of read. I absolutely love that the romance between them was mutually felt, but mutually fought against. Neither one of them wanted to like the other so it was so perfect. This tension was felt even more as the story is told in both point of views. You all know I have a serious LOVE for multiple point of view stories, so the fact that it was told in 2 POV's completely made my day. The beginning was very powerful. I won't tell you what happens, but just know I didn't expect it at all. The whole time I just kept thinking "No. That can't happen. Not so early in the story!" It was so unexpected that my fiance made me pause it so he could ask me what was wrong and that all of a sudden I had the saddest look on my face. It was great that each character really had their own unique personalities. No two people were the same, and it was shown even more how different they all were by the audio, since they all had different voices. The ending was also really great. It had a big cliffhanger ending and I really need to know what happens!! I highly, highly enjoyed listening to this book! I honestly don't think I would have had the same reading experience if I would have read it instead. Rebecca Gibel has a great voice to listen to. It's very smooth and she doesn't have any weird habits in her speech to remind you she is in a booth reading, instead of the characters really speaking. She had great inflection in her voice that really sold the characters to you. She wasn't afraid to read the parts how they were supposed to be read. I loved the way she had a different voice and pitch for each of the characters. I always knew who was talking, and I absolutely loved her New Jersey accent for the characters who had one. I highly recommend listening to this in audio, because it seriously MADE my reading experience. 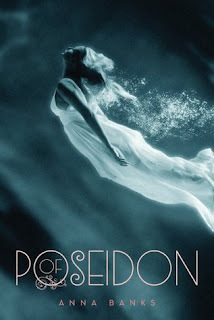 I am definitely planning on getting the second book, Of Triton, in audio as well! Absolutely loved this story. It had great tension in the romance department, which I really love. The beginning was really powerful and unexpected, and the ending was perfect. I am so happy that I listened to the audiobook. It completely made my reading experience, and I don't think I would have loved the story as much if I would have just read the book. I will definitely be continuing on with this series and will definitely be listening to it, instead of reading.